I’ll admit, green smoothies were the last thing I wanted to drink on a regular basis. Aside from the color being disgusting, the idea of drinking kale (which I prefer to eat in salads with LOTS of other things to hide the bitter flavor) was not very appealing. In doing research for one of my projects at work, I came across Simple Green Smoothies, who had a 30 day green smoothie challenge starting April 1. The drinks in the photos looked amazing (that’s what they are there for, right? ), and the website promised that their smoothie recipes would taste amazing, so I decided to give it a shot. Since April first, I’ve been blending up green smoothies for each day, and I’m honestly surprised how much I have been loving it. There is something empowering about starting your day off right with real, whole fruits and vegetables. Adding green smoothies to my daily routine has helped boost my energy, ensure I am actually getting something good in my body for breakfast, and has helped me almost eliminate those not-so-healthy drinks (coca-cola, I am talking about you). 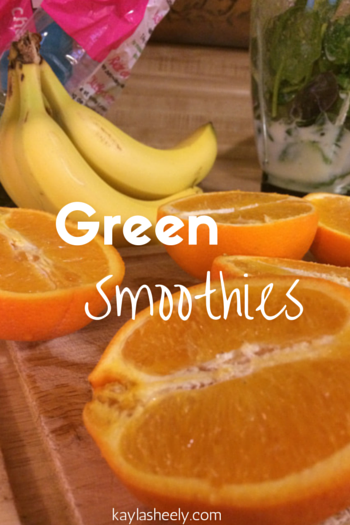 Simple Green Smoothies has provided all of the recipes, so it’s been easy for me follow their simple instructions. I would definitely recommend to try it out!